The replacement of saturated fatty acids (SFAs) with unsaturated fatty acids (UFAs), especially polyunsaturated fatty acids (PUFAs), has been associated with a lower risk of ischemic heart disease (IHD). Whether this replacement is beneficial for drug-treated patients with cardiac disease is not yet clear, so we examined the risk of cardiovascular disease (CVD) and IHD mortality when the sum of SFAs and trans fatty acids (TFAs) was theoretically replaced by total UFAs, PUFAs, or cis monounsaturated fatty acids (MUFAs). Participants were part of the Alpha Omega Cohort (read more about the AOC population here). The patients in the Alpha Omega Cohort consumed, on average, 17.5% of energy from total UFAs, 13.0% from SFAs, and <1% from TFAs. 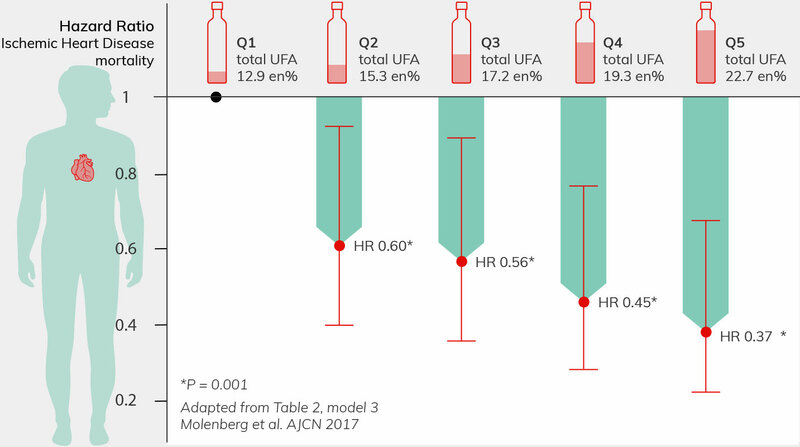 Substitution modeling yielded significantly lower risks of CVD and IHD mortality when replacing SFAs plus TFAs with total UFAs or PUFAs, whereas the hazard ratios in cis MUFA quintiles were nonsignificant. In continuous analyses as well, replacement of SFAs plus TFAs with total UFAs, PUFAs, or cis MUFAs (per 5% of energy) was associated with significantly lower risks of CVD mortality (HRs between 0.68 and 0.75) and IHD mortality (HRs between 0.55 and 0.70). To conclude, shifting the fatty acids composition of the diet toward a higher proportion of UFAs may lower CVD mortality risk in drug-treated patients with cardiac disease. In this theoretical substitution analysis in the Alpha Omega Cohort of Dutch patients with cardiac disease, we observed significant inverse relations with CVD mortality and IHD mortality when isocalorically replacing SFAs plus TFAs with UFAs. Because TFA intake was low, these associations resulted mainly from replacement of SFAs. Hazard ratio for IHD mortality per 5% of energy intake replacing total UFA by SFA plus TFA was 0.62 (0.47, 0.82). Dietary Fatty Acid Intake After Myocardial Infarction: A Theoretical Substitution Analysis of the Alpha Omega Cohort. Famke JM Mölenberg, Janette de Goede, Anne J Wanders, Peter L Zock, Daan Kromhout, and Johanna M Geleijnse. Am J Clin Nutr. 2017 Aug 09.